Accentuate your tan with full, round bristles that evenly distribute color for a smooth, natural finish. The short handle offers complete control and the tapered head gently blends color onto the face. •Crème will naturally adhere to synthetic fibers. 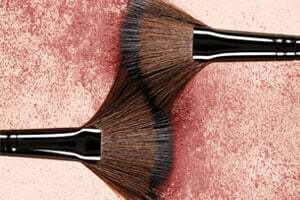 •For best results using any type of pressed powder, press bristles into powder to pick-up the powder. •Next, press brush onto back of hand to work the powder into the brush. •This will ensure powder is loaded into bristles and minimize fallout. •For added control, also use pointer finger with a light touch on handle, this will act more as a “guide” during application. •It should feel like you’re balancing the brush. •Hold brush with a loose grip, close to the end of handle and lightly pinch between thumb, pointer and middle finger. •This will provide the most “painterly” result.